Wealth advisors can receive prioritized alerts to increase awareness of opportunities to build relationships while having access to tools which enable them to take action while in the field so they can maximize their time meeting with existing clients and top prospects. 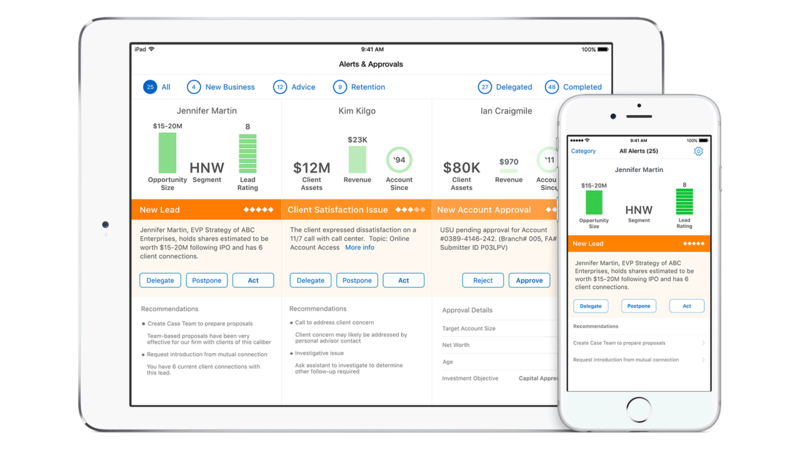 Empower your wealth advisors when on the road and pressed for time with a mobile platform that delivers critical alerts to keep them informed when it matters the most. Stay in-the-know when clients open new accounts or when an account is in need of re-balancing. Keep informed of new service opportunities. This app delivers real time alerts based on information from a variety of sources: portfolio accounting and related systems with holdings and transactions, repositories of profile information, source systems for approvals and alerts, internal investment research and third party financial news, contact center transcripts and CRM call reports.